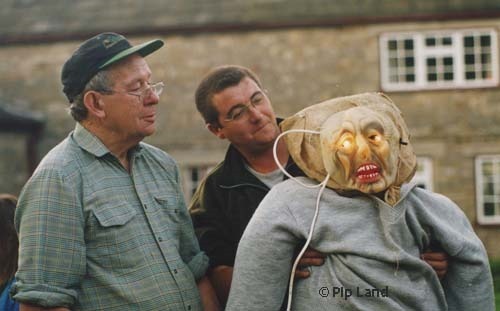 In 2002 I interviewed the late Alan Harker about the Burning of the Bartle tradition in West Witton. The article I wrote was published in The Dalesman in 2003. Below is a slightly amended version. 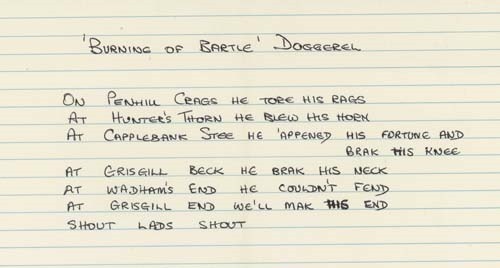 Above: The “Burning of Bartle” Doggerel as written for me by Alan Harker. Ghostly memories of harsher times when sheep stealers faced summary justice at the hands of local people are remembered each year in Wensleydale, with the ancient and unique ceremony of Burning the Bartle. The oral history for the centuries-old event (was) held by 75-year-old Alan Harker who could remember following the Bartle when he was about four-years-old. In August each year he and his small team made the effigy of the Bartle, stuffing trousers and a shirt full of straw and giving it a head. Then, at 9pm on the last Saturday in August, the 45-minute parade through West Witton began, starting from the west end of the village and ending at Grassgill where the Bartle was once again ceremonially burned. “Some have said it’s a harvest ritual which to me is daft because we had to plough out in wartime to grow corn and it didn’t grow because the climate wasn’t right. I believe he was a sheep stealer as what I was told by George Smorthwaite,” said Mr Harker. The late Mr Smorthwaite had been born in the village but later worked in London as a schoolteacher. He had collected some historical records about the village and the Bartle but these were lost in a fire. Fifty-one years earlier, when Mr Harker was asked to help with the ceremony, Mr Smorthwaite told him that it was already over 400 years old. By the time Mr Harker was seven he had learned the doggerel chanted at the ceremony off by heart from men like Bert Spence and George Stockdale who were then in their 50s. To him it spoke of a local man, chased down from Penhill and then executed. The term ‘Bartle’ he believed came from St Bartholomew’s Church. He was told by Mr Smorthwaite that the man, once caught, was probably tried at the village church court and that was why his effigy was traditionally burnt during the patronal festival. In the 1920s there were 70 children in the village school and all enjoyed the feast of St Bartholomew which included two sports days as well as the Burning of the Bartle. “It was a busy little village then,” Mr Harker remembered. There were about seven shops including the post office, grocer, baker, cobbler and joiner and there was plenty of work around for the local men, whether in the quarries, with the railway company or on the farms. “There was very little traffic then. There were only two or three motor cars in the village. It’s a bit dodgy now because of the traffic and some don’t keep the speed limit,” he said. Not only does the Bartle parade now become entangled with cars but one year a vehicle was even parked in the middle of the burning site. It had to be moved because Mr Harker was determined that all aspects of the ceremony must be retained. “It’s an old custom that’s gone on all these hundreds of years and it wants carrying on,” he said. 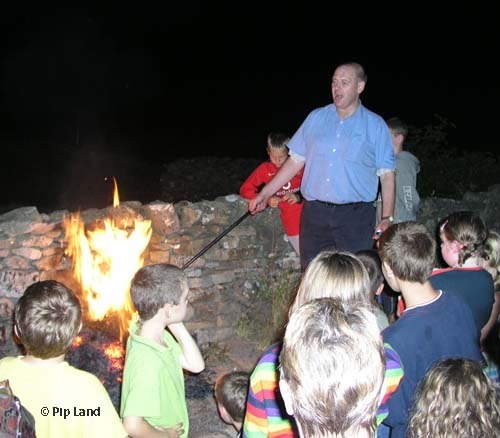 “It’s quite popular now but the feast nearly fell through.” In the 1980s there were sometimes only three people at the meetings to plan all the feast activities, including Burning the Bartle. The team in 2003 consisted of Mr Harker; his brother Robert, who had been helping for 26 years; his son, John, who after 16 years was the chief executioner, and Mr Robson. Along the way they were plied with drinks and chanted the doggerel, to the accompaniment of the Bartle’s flashing eyes. “When I started he had just one eye and we used a flashlight for it, switching it on and off,” Mr Harker said. Now they have a battery poked in one of the Bartle’s back pockets and have two eyes peering out of a plastic mask. Another innovation during Mr Harker’s 50 years had been to use a sheep’s fleece for the Bartle’s hair and beard. “It’s changed quite a bit but it is still a bag of straw when it’s done,” said Mr Harker. 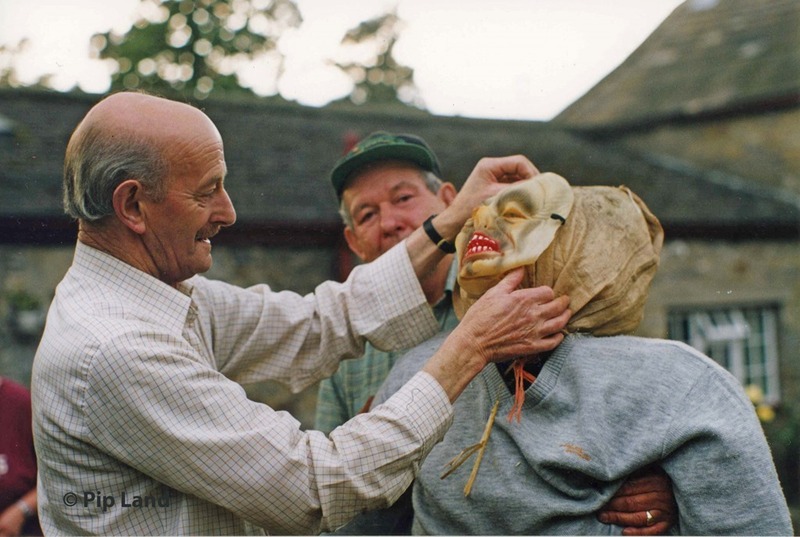 Above: Alan Harker fixing the face on the Bartle in 2002, while his brother, Robert, holds the straw effigy. Below: Robert Harker and Gareth Robson testing the “eye lights”. I hold the copyright for this article and also for the photographs – even if some have been posted on other websites (without my permission).